KTM’s new MSC system—a big deal? It’s no secret that I like BMW’s motorbikes because they offer some of the most advanced tech on the market, especially the R1200GS with all of its toys—ride by wire, electronic cruise control, riding modes, electronic semi-active suspension etc. These things appeal to my geek side. So when KTM made the rather grand claim that the 1190 Adventure with the new MSC (motorcycle stability control) system is the safest motorcycle on the market I had to see what the fuss was about. And, without a doubt, they are onto something. At its core, MSC is simply Bosch’s motorcycle ABS Gen 9 enhanced system, Bosch’s MM5.10 lean angle sensor unit and a software update. The physical components are also used on comparable high end bikes, including the current R1200GS, and provide anti-lock braking as well as traction control functionality. The ABS system consists of a number of sensors (wheel speed, braking pressure etc) and a tennis ball sized pump/control unit weighing in at around 700g. In simplistic terms, the system measures the speed of the wheels and pumps the brakes to ensure the wheel speed differential is within specified parameters. The ‘enhanced’ version can distribute pressure between front and rear brakes, regardless of which is used—a system known as electronic combined brake system, or eCBS. The lean angle sensor provides information about inertia, roll rate, yaw rate, longitudinal acceleration, transverse acceleration, vertical acceleration, and calculated values for lean and pitch angles. These values are used for anti-wheelie and anti-stoppie control, as well as for traction control (preventing spinning the rear wheel), anti-skid control (preventing too much application of power in corners), chassis regulation via the semi-active suspension and fall detection. These features are already in use on the R1200GS. Additionally, the K1600GT/L utilises this data to control the pivoting Xenon headlamp in corners, the S1000RR for its launch control feature, and the new R1200RT for its hill hold control system. So how is MSC different? 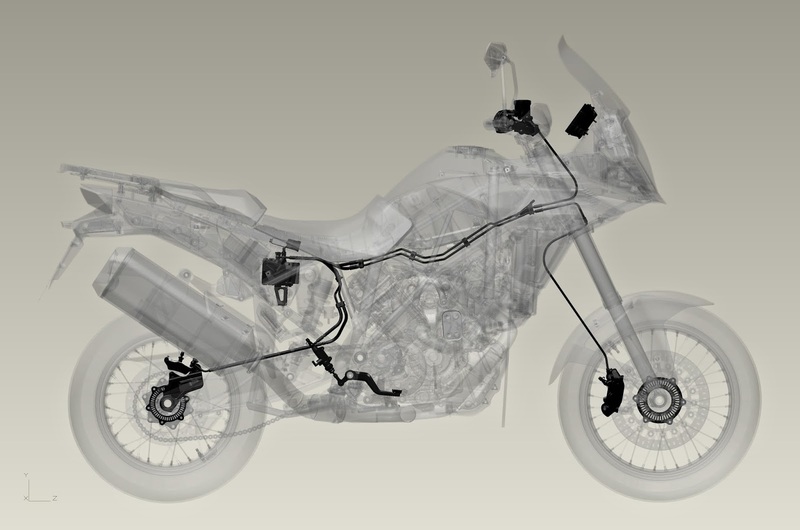 The key is in a software update which enables the ABS system to factor in more data from the lean angle sensor to regulate the ABS functionality while the bike is banked (leaning in a corner). This extra data enables the system to ensure the maximum braking power is applied to the correct wheels to ensure the bike remains neutrally banked, without highsiding or lowsiding, and without forcing the bike upright. Online reports of this new functionality are universally positive. The software update can be purchased and installed at a KTM dealership for about £335 which upgrades the ABS Gen 9 system to ABS Gen 9M—a bit steep in my opinion because it is simply a software update, but I suppose Bosch needs to recover their development costs. As the R1200GS has the necessary hardware, I would not be surprised if this feature becomes available before long for this bike as well—and rolled across the range for BMW’s other bikes which also use the same Bosch ABS/ASC components. For the minute, however, it seems the KTM is Bosch’s exclusive launch customer. If/when this becomes available for the R1200GS, I would be tempted to have it retrofitted, as I believe you can’t have enough safety nets when on two wheels. Or, perhaps when my lease is up, this will already be a standard feature. Would you pay £300+ to add this to your bike? Thanks to an eagle-eyed contributor on ADVrider for pointing out that the R1200GS doesn't have a discrete Bosch MM5.10 lean angle sensor unit. On further research, and although speculative, it seems the functionality is integrated into the chassis control module as the ASC and ESA systems both utilitise parameters and functionality consistent to what Bosch list for the lean angle sensor. As BMW don't advertise directly that they use Bosch components it's possible Bosch make a bespoke item for the 1200 which integrates the functionality of the lean angle sensor into BMW's own control module. This is not particularly far fetched (the Nav V GPS is a bespoke Garmin unit built for BMW), and it would mean it should still be possible for MSC to be retrofitted via a software update. Speculation aside, the values required to make MSC work are collected already by the bike's systems, so it's a matter of wait-and-see!